We got up and headed back to adorable downtown Fort Collins to grab some coffee. We were headed onward to the Rocky Mountains! 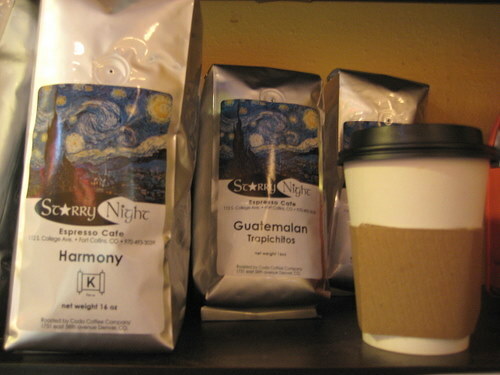 We had spotted cute Starry Night Coffee the day before during our walks. 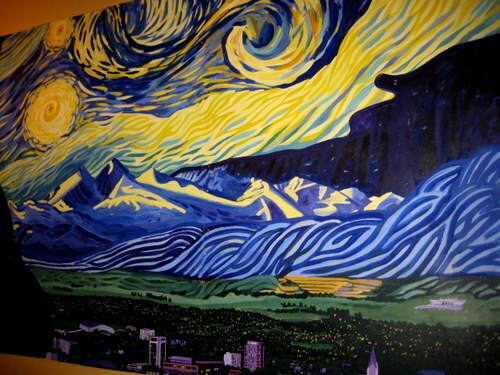 They have a really cool version of Van Gogh’s starry night painting on one of their walls, with a mini Fort Collins in the foreground. 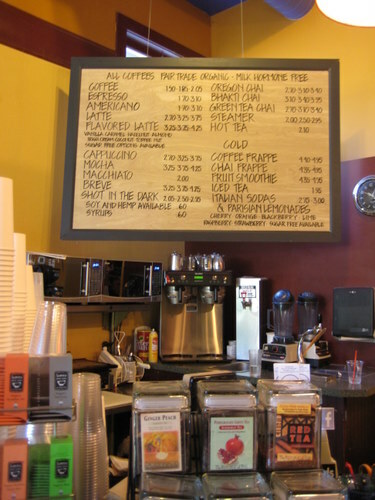 It’s your standard local coffee joint with coffee, tea, juices, and some food. They had baked goods and some sandwiches and salad type things. This place is not hipster. It’s just cute. Small, but not tiny… it’s cozy. They had some flavored lattes so I got a toffee nut latte, because you know, there’s nothing like a cup full of candy bar. I asked if it was possible in decaf and she complied! And here, they actually gave me a decaf. Success! And of course, they have coffee beans for sale. Their coffee was perfect fuel for our trip to the Rockies!